Ohmygod, ohmygod, ohmygod! 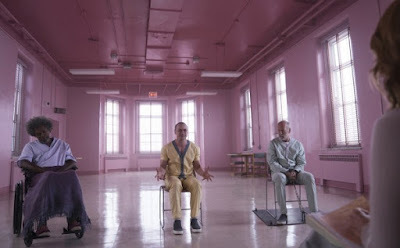 The first trailer for M. Night Shyamalan's Glass has arrived, and it is a thing of beauty! Fans have waited 17 years for a sequel to Unbreakable, not knowing Shyamalan snuck one in under the radar (kinda) with Split. Thankfully, that movie was a big hit, because the fine folks at Universal and Blumhouse put things in motion to bring the characters of The Beast, David Dunn and Mr. Glass together. Glass stars Bruce Willis, James McAvoy and Samuel L. Jackson. It hits theatres Jan. 18, 2019. And it looks like the Shyamalan who gave us The Sixth Sense, Signs and of course, Unbreakable, is back. Good!